Our Mega Flame Decals are highly reflective and are made for maximum coverage area. Reflective Helmet Flame Decals work best when the reflective surfiace is mazimized. 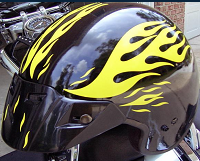 Our reflective Mega Flame Helmet Decals are extra "chunky" to give your helmet maximum reflective exposure. Built for Style, Made for Safety! Classic Reflective Helmet Flame Decals are bright and notiable at night. Classic Helmet Flame Decals are designed with a more conventional flame style. These reflective flame decals retain a classic and more slender look while still maximizing size to provide good visibility. You might want to consider combining our Classic Helmet Flame Decals with matching motorcycle flame graphics available here at StreetGlo.